It is definitely new drinks season. Not only has there been a new range of Shloer soft drinks released, but I also found this new Rubicon Street Drinks Nimbu Pani. I hadn’t heard of Nimbu Pani but the Rubicon can describes it as a still drink flavoured with lemon, mint and cumin. I popped open the can at lunch time and gave it a try. I finished the whole can and still couldn’t decide if I liked the drink or not. The flavour starts with a fairly swift lemon hit. It wasn’t too zingy or sharp, more like sweet lemonade (but still). The mint was a lovely addition adding a cooling freshness that tasted like summer and reminded me of hot summer’s days. I wished the flavour had ended there. There was however cumin, which to me is one of the base flavours of curry. 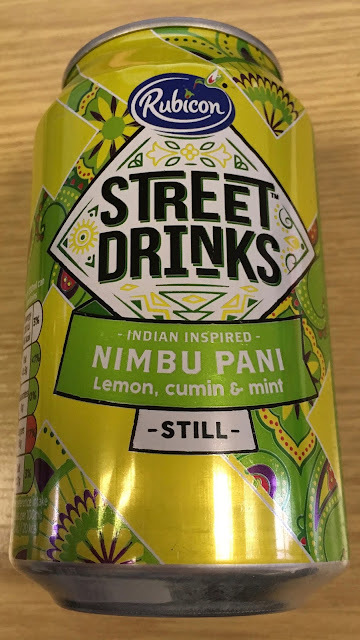 I tried to tell my tastebuds that this added a complexity to the flavour which almost delivered spice, but they simply replied; “but it tastes of curry”. I could almost see how cumin could work in the drink, but every second sip my conditioned tastebuds just didn’t get it. I wanted to like it, I felt I could get used to it with another can, but ultimately I have to admit the cumin didn’t work for me. It was nice to try something new like this Rubicon Street Drinks Nimbu Pani though, I wonder if there are any other new drinks in the range. I’ll keep my eye out of course.